Beef patties are stuffed with mozzarella cheese and served with a sun-dried tomato basil relish for a twist on the classic caprese theme. These burgers are unique and delicious! I’m a little caprese crazy. Caprese=Fresh mozzarella + tomatoes + basil, and together those ingredients make one of the best food combinations of all time. Being burger season AND tomato season, I decided to apply the caprese theme to a burger, and it is nothing less than gloriously delicious. 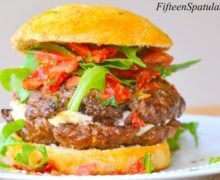 The fresh mozzarella is sandwiched between the beef, and the basil and tomato are incorporated into a tasty relish topping. You could grill the burgers, but if it’s miserably hot outside (and where I’m at, it’s very smoky from the Georgia wildfires), I think cooking them in a cast iron pan inside is even better. You get a really flavorful caramelized crust to the meat when you cook it in the cast iron pan. Recipe time! To make the relish, start by chopping up the sundried tomato and the basil. 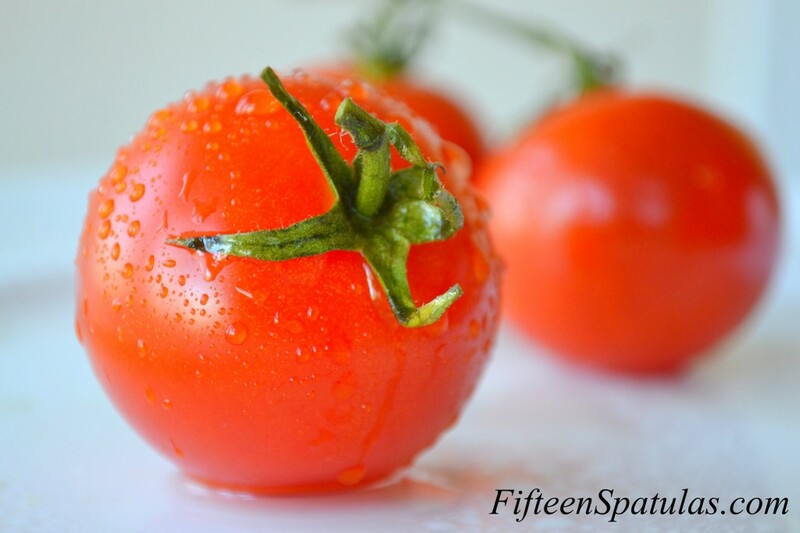 Combine those with the chopped fresh tomato, add 1 tbsp of the olive oil from the packed sundried tomatoes, and season with salt and pepper to taste. Set aside. Season the ground beef with salt (I did 1.5 tsp), pepper (I did 1 tsp), and the red pepper flakes. Break off a little piece and cook it so you can taste for seasoning. Adjust salt and pepper as deemed necessary. Divide the ground beef into 8 portions, and form them all into thin patties. Ensure that you don’t overhandle the meat, or it will get tough. Heat up a large cast iron skillet over high heat. Wait until the skillet is smoking hot before adding the burgers, to ensure a nice seared crust on the meat. Place the patties onto the skillet, and cook for about 2-3 minutes on each side, until the pink is gone (unless you ground your own meat, that is). Place a mozzarella slice on four of the patties, and place the remaining four patties on top, so you have sort of an oreo looking cheese sandwich. Let the cheese melt, then remove from the pan. 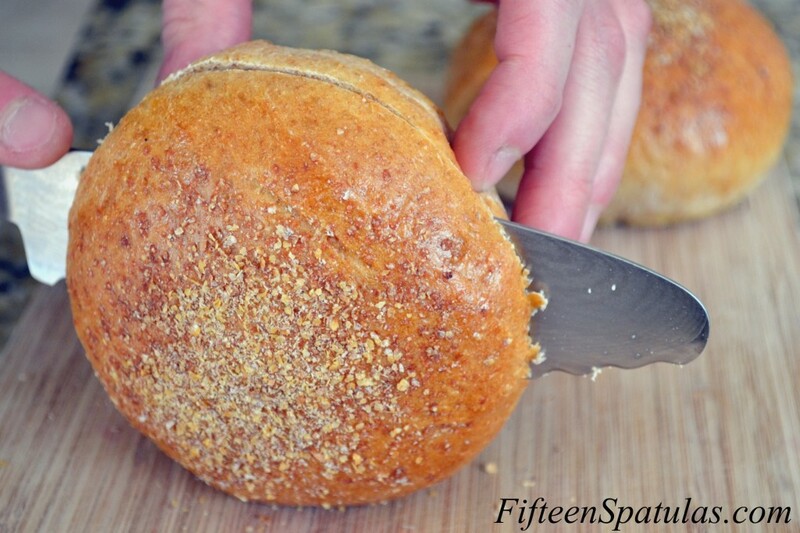 Toast your hamburger buns if desired, then place the burgers on the buns. 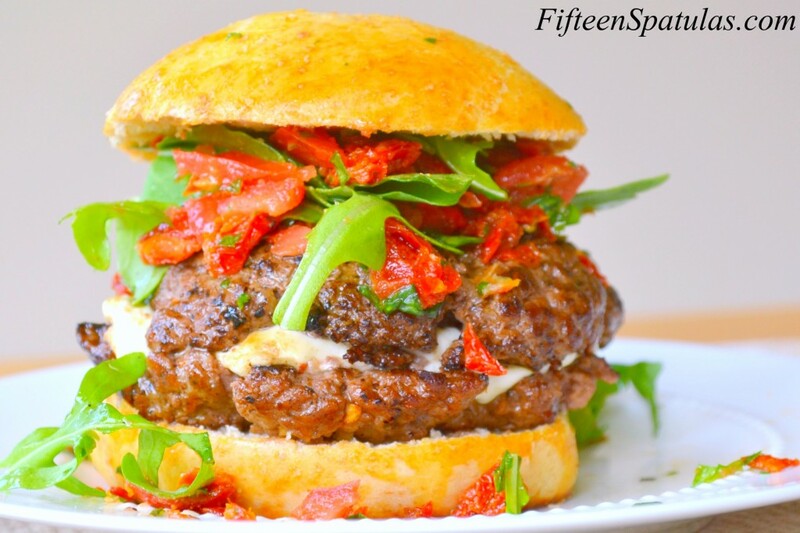 Top with the sundried tomato relish and some arugula, and serve. Enjoy! Wow, that looks just amazing. It’s 9 a.m. and I could eat two!